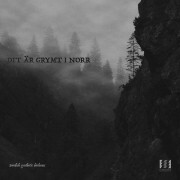 ‘Det Är Grymt I Norr’ is a compilation of exclusive tracks by artists reflecting the contemporary Swedish underground electronic music scene: ALVAR, Celldöd, Dissociō Modus Trāns, Hjärnkultur, Agent Side Grinder, Kinder aus Asbest, Æmɨt and Yabibo Hazurfa (special Scandinavian letters not included). The title of the compilation, Swedish for ‘It’s grim up north’, describes the atmosphere perfectly – in Swedish, ‘grymt’ also means cool. The gloomy cover was designed by Erik Söderberg. Subtitled ‘Swedish Synthetic Darkness’, the music on the album is intense, hard and cold at first listen but boiling with emotions underneath the surface. Expect industrial, EBM, coldwave, acid and everything on the spectrum between electro and ambient. Thank you for the music.